Apply online before October 15, 2018. Applications will be available September 1. The Reading Cultural Council (RCC) encourages organizations interested in funding support for 2018-2019 community-oriented arts, humanities and science programs in Reading to submit an application for funding. 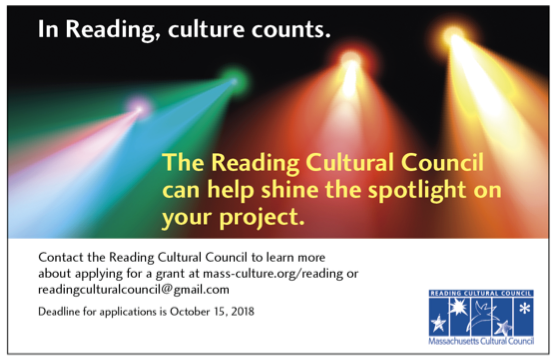 Online application forms will be available after September 1, at https://www.mass-culture.org/Reading Applications must be submitted on or before October 15, 2018. You can start an application and save it midway and return to complete and submit it later. Paper applications will not be accepted. Applicants will be invited to meet with the committee in November to explain the project. Grant awards will be announced in January 2019. Projects should contribute to the cultural vitality of the Reading community and be performed at an accessible Reading venue (field trip projects excepted). Before submitting an application, please review the Reading Cultural Council’s priorities which are listed here: https://www.mass-culture.org/Reading. Because the demand for funds typically exceeds available funds, only one application will be accepted from each organization or applicant unless different constituencies are being served. Programs must have alternate sources of funding and guarantee they will run with only partial RCC funding. Grants are reimbursement-based, meaning the applicant organization expends its own money and if approved for a grant, submits paperwork for reimbursement. Reading Cultural Council Chair Donna Schenkel emphasizes that Reading Cultural Council grants support a variety of community organizations and interests from arts, humanities and science projects and activities in Reading, to school field trips, in-school and after-school programs, concerts, festivals, lectures, theater, dance, music, film and more. Projects take place in our Reading schools, the library, the senior center, elder care facilities, town hall, parks, and other locations where the community comes together. Projects should serve Reading residents. In FY18, the Reading Cultural Council awarded $6561 to support the arts and humanities programming of twelve (12) organizations. The Reading Cultural Council is part of a network of Local Cultural Councils (LCC) serving all cities and towns in the Commonwealth. This is the largest grassroots cultural funding network in the nation, supporting thousands of community-based art, science and humanities projects every year. The Massachusetts state legislature provides an annual appropriation to the Massachusetts Cultural Council, a state agency, which then allocates funds to each community cultural council. If you are an advocate for or lover of local arts and culture, please consider joining our Council. Members of the Reading Cultural Council are volunteers appointed by the Reading Board of Selectmen. To learn more, visit the Reading Cultural Council page on the Town of Reading website [readingma.gov/cultural-council], contact Donna Schenkel, chair, [readingculturalcouncil@gmail.com] or speak to the Reading Town Clerk.